Carpal tunnel release is a surgery used to treat and potentially heal the painful condition known as carpal tunnel syndrome. Doctors used to think that carpal tunnel syndrome was caused by an overuse injury or a repetitive motion performed by the wrist or hand, often at work. They now know that it’s most likely a congenital predisposition (something that runs in families) – some people simply have smaller carpal tunnels than others. Carpal tunnel syndrome can also be caused by injury, such as a sprain or fracture, or repetitive use of a vibrating tool. It’s also been linked to pregnancy, diabetes, thyroid disease, and rheumatoid arthritis. The median nerve and tendons that allow your fingers to move pass through a narrow passageway in the wrist called the carpal tunnel. The carpal tunnel is formed by the wrist bones on the bottom and the transverse carpal ligament across the top (or inside) of the wrist. When this part of the body is injured or tight, swelling of the tissues within the tunnel can press on the median nerve. This causes numbness and tingling of the hand, pain, and loss of function if not treated. Symptoms usually start slowly, and may get worse over time. They tend to be worse on the thumb side of the hand. 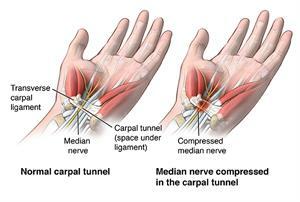 During a carpal tunnel release, a surgeon cuts through the ligament that is pressing down on the carpal tunnel. 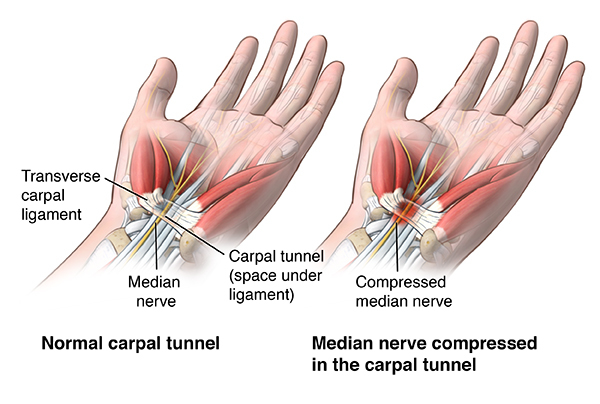 This makes more room for the median nerve and tendons passing through the tunnel, and usually improves pain and function. Why might I need carpal tunnel surgery? What are the risks of carpal tunnel surgery? How do I get ready for carpal tunnel surgery? Tell your doctor about all medicines you are currently taking, including over-the-counter drugs, vitamins, herbs, and supplements. You will probably need to stop taking any medicines that make it harder for the blood to clot, such as ibuprofen, aspirin, or naproxen. If you’re a smoker, try to quit before to the surgery. Smoking can delay healing. Carpal tunnel release is usually an outpatient procedure, which means that you can go home the same day as the surgery if all goes well. 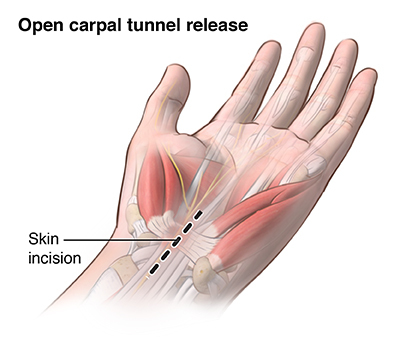 There are 2 types of carpal tunnel release surgery. The traditional method is the open release, in which the surgeon cuts open the wrist to do the surgery. 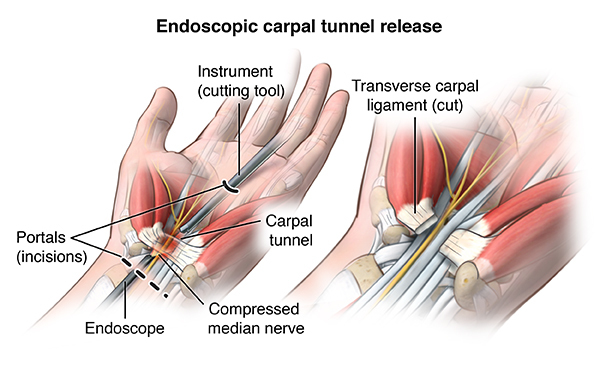 In an endoscopic carpal tunnel release, the doctor makes 2, half-inch incisions. One is on the wrist, and one is on the palm. Then he or she inserts a camera attached to a narrow tube into one incision. The camera guides your doctor as he or she inserts the instruments and cuts the carpal ligament through the other incision. Once the surgery is done, you’ll be monitored for a short time, and then allowed to go home. Only in rare cases or complications is an overnight stay needed for a carpal tunnel release surgery. Your wrist will likely be in a heavy bandage or a splint for 1 to 2 weeks. Doctors usually schedule another appointment to remove the bandage or splint. During this time, you may be encouraged to move your fingers to help prevent stiffness. The recovery period can take anywhere from a few days to a few months. In the meantime, you may need to adjust job duties or even take time off from work while you heal. Your doctor will talk to you about activity restrictions you should follow after surgery. These problems may need to be treated. Talk to your doctor about what you should expect and what problems mean you need to see your doctor right away. Constant agonizing pain is hard to imagine for most. It consumes you, confines you, and can destroy your family and work life. Spinal cord stimulation is a path you can take to move beyond the pain, to step back into the life you once new. Spinal cord stimulation (SCS) is the most commonly used implantable neurostimulation modality for management of pain syndromes. It is a pain treatment modality predicated on reducing the intensity, duration, and frequency in which pain is felt. Dr. Vashi uses the first and only system of its kind to allow for MRI’s to be performed with a stimulator in place! Dr. Vashi mainly uses them to help control radicular pain, otherwise known as sciatica. It is not solely used postoperatively. At times, it can be used to control/manage your pain without having back surgery. It starts with a trial. This is important for a variety of reasons, but mainly it serves as an evaluation period for you and Dr. Vashi to determine if spinal cord stimulation is the right course of action for you. Before committing to long-term therapy, you will have 7-10 days with the trial to gauge its effectiveness. Call us today to schedule an appointment to see if you may be a candidate! 262-764-5595.